Drums of chemicals must be weighed for many reasons. The gross weight may need to be known for shipping purposes. The net weight may be needed for inventory, or to determine usage in some process. Formulation may actually take place in the drum, where a variety of ingredients are combined to produce the desired results. The most common drum size is 55 gallons. The diameter of that drum is about 24. Assuming a liquid content, the filled drum may weigh from 500 lb up to about 800 lb. A drum scale must have a number of specifications to be suitable to weigh this type of drum. Primarily, it should have a capacity of 1000 lb. The readability of the digital indicator should be accurate enough for the application, which would typically be 2/10 of a pound. It is also important that the scale have a low profile to make it easy to roll drums onto or off of the scale platform. Arlyn Series 3250 Drum Scales meet these requirements. 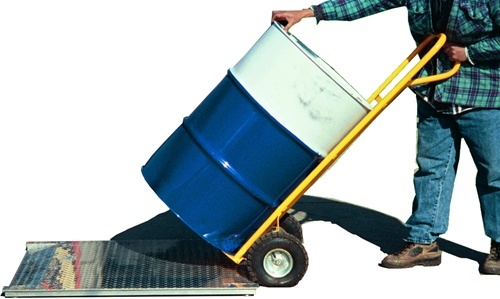 The standard platform size is 36 x 36, making it large enough to accept wheeled drum carts. The platform has a very low height of only 1 7/8. The scale comes with a ramp, making it very easy to roll drum carts. The included digital indicator uses a graphical screen with very large digits. This allows the scale to be read by an operator who may be across a room from the scale. But the operator may also choose to put the indicator in alternate modes of display. The graphic display provides the flexibility to view weight information in a variety of different formats. A drum scale may be subject to difficult abuse. If a drum is loaded onto the scale by hand, there can be a significant amount of shock loading. If a forklift hits the scale from the side, there will be a very high level of side loading. This type of use can easily damage the scale’s load cells. In order to minimize this type of failure, the Arlyn Drum Scales use load cells made from stainless steel. These show much better resistance to this type of abuse than either aluminum or plated steel, which are more typically used for drum scales. The stainless steel will also tolerate a more corrosive environment, offering longer life time operation. The scale platform should be very rigid in order to assure the best accuracy. While sheet metal construction is often used, a welded frame will offer the best operation. Generally, a treadplate pattern on the platform will offer the best non-slip surface. Welded channels under the scale platform assure excellent strength. In some situations, drums will be loaded by hand instead of using drum carts. In that case, a smaller scale platform would be preferable, so that less floor space is needed. Other standard sizes that are available include 30 x 30 and 20Ó x 27. These models also have a very low profile and incorporate stainless steel load cells. While pounds are the most common units used in the United States, kilograms have become standard for many industrial applications. A front panel pushbutton allows the operator to toggle between these two units for convenience. Other available units include ounces and grams. Another important feature is the ability to subtract the weight of the drum, so only the net weight of the contents is shown. The tare button will perform this operation. The net and gross buttons are used to allow the operator to show the weight in either format. Generally a drum scale will be in a location where it may be plugged into a standard wall outlet. But there are situations where that may not be available. This may include mobile applications or when the scales must be used out in the field. So the scales may be provided with a 12 vdc vehicle input, or can be used with a rechargeable battery. Because the power consumption of the scale is very low, a vehicle supply will not significantly drain the vehicle battery. The alternate choice of a rechargeable battery allows the scale to run for up to 40 hours of operating time between charging. The battery pack itself may be easily located inside the scale indicator, so as not to interfere with operation. Charging time can be as short as four hours for a full charge.